Nabisipi UenapeuHipu Outfitter is the result of a partnership between two friends, Éric Walsh and Mario Courtois, two experienced entrepreneurs from different cultures who share the same passions and above all the same values. Éric Walsh, owner and entrepreneur of a farming business in Dundee Quebec, has been fishing Atlantic salmon for over 32 years. 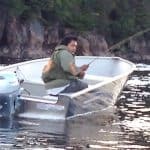 Éric has been fishing and hunting in Innu territory for nearly 20 years. His rich experience extends from George River, a tributary Ungava Bay to the Miramichi in New Brunswick. 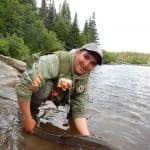 Mario Courtois, owner and operator of Pourvoirie La Galissonnière, resident of Natashquan is a brilliant chief guide of the Hipou outfitter for which he has worked for more than 30 years. 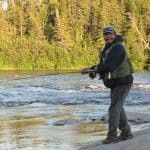 Mario brings his expertise in fly fishing, wildlife, flora and nature interpretation and shares his extensive knowledge of the local community. Mario and Éric have been fishing on the Natasquan River for nearly 20 years. This is where their friendship began and has been growing ever since and their intercultural adventures continue. It is with pleasure that Éric and Mario invite you to immerse yourself in a culture, a nature but especially an unforgettable adventure. Air Canada Jazz and Air Labrador provide daily round-trip service from Montreal to Sept-Îles. We invite you to consult their schedules as soon as possible. In Sept-Îles, you will need to rent a car to get to the outfitter. Return: To avoid unnecessary stress, we recommend that you book a late afternoon or early evening flight. 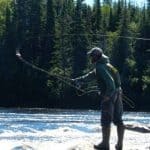 You will need good fishing rods and reels that can hold 150 to 200 yards of “back line” reserve yarn with a minimum strength of 20 lbs and a floating and sinking silk. An assortment of dry & wet flies will be useful. You can purchase your salmon fishing license at the local Aguanish store. 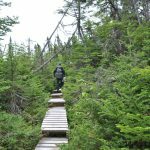 You will need comfortable clothing, rainwear, waterproof boots, polarized glasses are also very useful and most importantly, do not forget your insect repellent! For your SAFETY : You must wear a flotation device at all times when you are aboard our boats. Wearing glasses during fishing is highly recommended. We do not offer alcoholic beverages at the camp (beer, wine & spirits), however you can purchase them locally. We can assist you with all stages of preparation for your stay: before, during and after so do not hesitate to contact us if you have any questions. 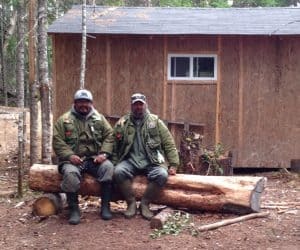 Eric has been fishing and hunting in Innu territory for nearly 20 years. 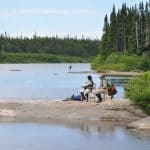 His rich experience includes more than 30 years of salmon fishing which extends from the George River, a tributary of Ungava Bay to the Miramichi River in New Brunswick. Mario, owner and operator of Pourvoirie Lac la Galissonnière is a brilliant chief guide of the Hipou outfitter on the Natashquan . He brings his expertise in salmon angling and shares his great knowledge of the local community. Christian is our Chief Guide. He stands out for his reliability and especially his knowledge of the river; and it was along the Nabisipi in a canoe and oar that Christian received a part of his precious heritage. Hervé is a seasoned guide, appreciated for his professionalism. Hervé hides phenomenal talents handling a fly rod as well as a pleasant sense of humor. Copyright 2016 Nabisipi | Tous droits réservés.